What’s Superman’s citizenship status? How was Clark Kent adopted? Back in 2011, “Action Comics” #900 made a brief media splash when a story had Superman decide to “renounce” his American citizenship. The story stated Superman didn’t want his actions interpreted as those of the United States. DC quickly forgot about this story, while the New 52 reboot later that year rendered it moot. However, it did spur a lot of discussion on Superman’s citizenship status. Related to such comes the question of how the Kents managed to take in and keep little Clark. Superman’s adoption and citizenship status have changed greatly over the years, reflecting both DC’s and real life’s changes. Thus, I thought I’d look at how each major era of comics has treated both. I’ll also look at some spin-off media (movies, TV). Superman (vol. 1) #53. Art by Wayne Boring. There doesn’t seem to be any Golden Age stories, or post-Golden Age stories set on Earth-2, that really went into what Superman’s citizenship status is like. Presumably, it’s similar in status to his Earth-1 counterpart’s below. However, stories did cover Clark’s adoption. 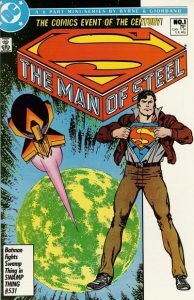 As summarized in 1986’s “Secret Origins” #1 (based on “Action Comics” #1, the Superman newspaper strip, and 1948’s “Superman” #53), John and Mary Kent found Kal-L after his ship landed on Earth. They subsequently took Kal to the Smallville Orphanage, formally adopting him and naming him “Clark.” Later, the Kents learned Clark possessed various powers. “Secret Origins” also states Clark landed on Earth in the late 1910s. Adoption standards at the time were likely more lenient versus today. Clark presumably would’ve been accepted as a citizen by default. Citizenship standards for adoptees were clarified in later laws (see the Silver Age entry below). “Limited Collector’s Edition” #C-31 (1974). Art by Curt Swan. By the Silver Age, Superman and Clark Kent’s citizenship statuses became more fully clarified. Clark fits all of these as far as anyone who isn’t in on his secret’s concerned. The Kents found him as an infant or toddler, and there’s no sign of his birth parents. As far as I know, there aren’t any Superboy-era stories where someone claims Clark was born outside the US. Thus, Clark’s a natural-born US citizen as far as anyone’s concerned. Similar to the Golden Age, the Silver Age Kents took Clark to, and adopted him from, the Smallville Orphanage, and later learned of his abilities. “New Adventures of Superboy” #12 (1981). Art by Romeo Tanghal. As for Clark’s Superman identity, Congress (and the President) has the right to grant an honorary citizenship to any non-citizen of the United States. Congress did just such at the dawn of Clark’s Superboy career in “New Adventures of Superboy” #12 (December 1980). Accompanying and reinforcing this is 1974’s “Limited Collector’s Edition C-31” (a retelling of 1961’s “Superman” #146). There, the adult Superman is granted honorary citizenship in every member nation of the United Nations. This includes the United States, of course. The story’s intention was that Superman’s a character and concept that belongs to the entire world, not just America. Among the other changes made to Superman’s backstory with Byrne’s “The Man of Steel” miniseries in 1986 is that Superman was “born” on Earth. In this origin, Jor-El placed Superman’s “genetic material” (read: fetus) in a Kryptonian “birthing matrix,” attached a rocket engine, and launched it to Earth. Upon landing, Kal-El had fully gestated into being an infant. This came up in a 1991 non-canon story where the US elected Superman president. In that story, the Supreme Court unanimously ruled he’s a “natural born” US citizen. However, in regular post-Crisis continuity, there’s no indication if the US Congress granted Superman an honorary citizenship as they did pre-Crisis. 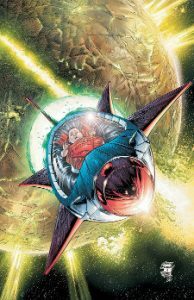 As for Clark, shortly after the Kents found his rocket, an improbable and ludicrous five-month-long snowstorm bound the Kents to their farm. After this time, the Kents claimed Martha had given birth to Clark, passing him off as their naturally-born child. Thus, in this version, Clark is viewed as a natural-born citizen of the United States. At the time, DC wanted to divorce Superman from Krypton as much as possible (beyond his origin’s requirements), thus the above changes. This was the opposite of pre-Crisis stories’ frequent mentions of Krypton. Byrne’s version stood in the comics for quite awhile. However, non-comics adaptions at the time ignored Byrne’s version. My guess is both its less-than-family-friendly aspects and complexity. Parents don’t want to explain to their kids about gestating “genetic material,” to put it mildly. Thus the media spin-offs of the era either were vague about his adoption status or went with the Golden/Silver Age version. Superman’s origin changed again in the 2000s. The first revisions came in the 2003-2004 “Birthright” miniseries; a second revision came again in the 2009-2010 “Superman: Secret Origin” miniseries. Both origins reintroduced pre-Crisis elements of Superman’s backstory. The biggest elements to return are that Clark was born on Krypton and valued his Kryptonian heritage. Neither story discussed Clark or Superman’s citizenship status, or as far as I can find, adoption status. However, 2011’s “Action Comics” #900 has Superman declare his plan to renounce his American citizenship. Perhaps Congress/the United Nations granted him an honorary citizenship after all? As for renouncing one’s citizenship, the blog Law and the Multiverse touched on this subject. “Action Comics” (vol. 2) #5 (March 2012). Art by Andy Kubert. The 2011 New 52 reboot keeps with traditional versions above. Superman landed on Earth as an infant, and found/adopted by the Kents. Differing in this origin (as shown in “Action Comics” (vol. 2) #5) is that the US military kept the rocket, after investigating reports of an unidentified object landing in Smallville. The story delves into the Kents’ history of attempts at having children (naturally or via adoption). Beyond this, however, the New 52 version of events don’t seem to discuss how Clark was actually taken in by the Kents. Still, assuming he’s presented as adopted, Clark would still be considered a citizen by default. Superman’s citizenship status isn’t discussed. Still, Congress might have granted him an honorary citizenship at some point. Or possibly not, given the New 52 DCU is a much more cynical and less idealistic place. DC’s Rebirth revisions in 2016 confusingly merged the New 52 and post-Crisis versions of Superman together. As far as I can tell, the current status quo is presumably the post-Crisis version of Superman (as of 2011), with some New 52 elements. The 2000s CW primetime series “Smallville” offered a variant on Clark’s adoption. 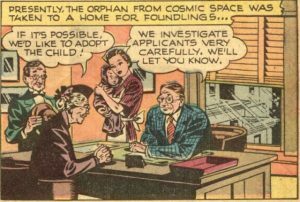 After finding Clark in the meteor shower that he arrived on Earth in, the Kents managed to get wealthy businessman Lionel Luthor (who they helped during the meteor shower) to forge adoption papers for Clark. This became a plot point during the show’s run. Oddly, the comics didn’t really use this idea, as far as I can find. “Superman: American Alien,” a 2016 non-canonical miniseries, did use it, though no indication of Lex’s father being involved. The Christopher Reeve movies showed Clark passed off as the son of a relative of Martha’s. As such, Clark would still be assumed to be a US citizen by default. The varying origin versions complicate analyzing things. However, for most versions of his backstory, Clark Kent would be considered a natural-born citizen, under the US’ citizenship laws about abandoned infants. As for how the Kents took in Clark, traditional versions show him as formally adopted. Modern versions are either vague or greatly vary. 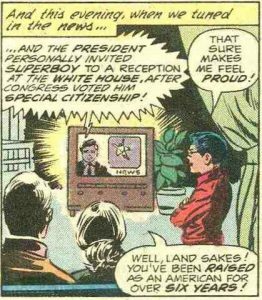 As for his Superman identity, Congress does have the power to grant an honorary citizenship, as they did in the Bronze Age Superboy story noted above. There’s no reason they couldn’t have done the same in other continuities; thus, that plus the United Nations story seems as good an answer for Superman’s citizenship status as any. So overall, Superman and Clark Kent are as American as any other fictional American character… and depending on the canon, he’s also as Canadian as his co-creator, artist Joe Shuster! “an improbable and ludicrous five-month-long snowstorm bound the Kents to their farm” The snowstorm was the doing of the Manhunters, as explained in Millennium. I noted that in the line following that statement. Doesn’t make it any less ridiculous, at least for me being a near-life-long midwesterner who’s lived in lake-effect snow country/dealt with plenty of snowstorms. The Kents wouldn’t be cut off from the outside world that long like “Little House on the Prairie”—Smallville like any place dealing with lots of snow would have snow removal equipment, etc. (plus radio, TV, phones, etc.). They could’ve had Martha being recluse for months or away for months. There is ball about food and shelter for five months. Could only pass him off as their own as a new born baby not a toddler. They wouldn’t risk adopting him through child services, seeing a baby with super strength. They could’ve used he’s Martha’s sister or cousin’s child. In most versions, the Kents *did* adopt Clark formally through the Smallville Orphanage/child services. Some versions, but not all, show him displaying super-strength as a baby, but the orphanage authorities writing it off/playing it for laughs. In the 30’s you could easily adopted a kid you found through child services without question but nowadays it would be more complicated. Adopting him through child services would be risky because they’ll likely run tests and if he shows off super strength call the feds. Openly adopting him and turning him over to child services would risk people finding out his secret by doing health checks on him. Adoption laws now are more stricter than they were during the 30’s and 40’s. The Kents would have cupboards which must have 15 million stacks of food while snowed in for months. You don’t have the The Movie and Earth One explanation where they just say he’s Martha’s sister or cousin’s child. The Kents could go to some counterfeiters to forged adoption papers from an agency that’s gone bust. But, like it mentions, this isn’t necessary. There are already laws for “foundlings” – it’s not that unheard of to just find an abandoned baby somewhere. All the Kents needed to do was take baby Clark to the police, saying they found him near their property (technically true), and say that they wanted to adopt him if nobody came forward claiming to be his parents. Nobody would, and under the foundling law he would be presumed to have been born in America unless someone could prove otherwise prior to his 21st birthday. Can’t take him to the police they would find out he’s different, a baby with super strength and do health checks. It would be too much of a risk to adopt him through proper channels, they would end up exposing his secret. Again, in some pre-Crisis versions (particularly the Golden Age version), the orphanage officials *did* see Clark pull some super-strength stunts, but it was played for laughs (and presumably subsequently ignored/denied by the staff). Pre- or post-Crisis, the Kents didn’t learn of Clark having powers until *after* he was adopted by them and taken home. Finding him in a rocket was the most unusual aspect (and what they’d not mention to anyone). Ultimately, given the Kents’ personalities, I suspect they’d want to do everything “officially” as much as possible anyway. 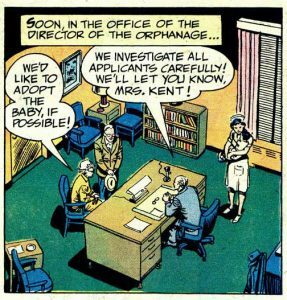 As Yglorba above says, he’d just be taken to the authorities, reported as an abandoned infant (which is true), and presumably allowed to be adopted by upstanding/fairly well known local citizens, the Kents. (Glossing over real-life foster care wait lists, etc., but again, the Kents are usually well known locally, so maybe authorities would be lenient?) Byrne’s snowstorm raises more questions than it answers, as might forging adoption papers (though the latter worked on “Smallville” as part of an ongoing storyline, plus the show’s other unique non-comic elements). Problem in doing it officially is the risk of making people cautious about where he comes from especially in his Superman years. The world is much more complicated than it was in the 30’s, the adoption process is a tough one even you go through proper channels. All the explanations above allowed to adopt a abandoned infant without question is too perfect and trying to cheat out of too many problems. It’s a bit time worn for Kal El to be adopted legally though child services and for The Kents to simply adopt him with question or health checks. There are health check laws for abandon infants so it would risk exposing his secret. So passing him off as their own kid or forge paperwork leads to stronger possibilities. In Earth One they were thinking of turning him over to law enforcement but after seeing him bend a steel bar decided to tell everyone he’s Martha’s sister’s kid. Adapt Lionel Luthor forging Clark’s adoption papers into the comics as they took pits and pieces from SV a number of times. Birthright, Secret Origin and New 52 skip the adoption part so it’s pretty much left to the imagination, but none of the modern origin stories use the orphanage scenario because things are more complicated than they were during the 30’s and 40’s there’s health checks, procedures etc. I suppose all of the versions have flaws (though I suppose a story could be told about the orphanage/child services staff turning up years later, or forged adoption papers as an ongoing plot device a la “Smallville”). But again, given the nature of Smallville/Superman’s backstory and other elements (glasses as a “disguise,” etc. ), I’d assume versions where he’s legally adopted also take a similarly old-school/idealistic view (along with what I wrote in the post about existing laws, etc.). The orphanage and how the staff react had to do with the codes at the time where it would be played for laughs and adoption wasn’t as complicated and strict as it is now so they would let anyone adopt a foundling they found without question, so make it kinda lost it’s plausibility by the time of Superman The Movie, John Byrne’s Man Of Steel and Smallville etc. Realistically the Kent’s wouldn’t trust Kal El in anyone else’s care thinking he’s Russian or NASA experiment have to protect him from them or they knew he’s an alien by looking at his ship.